﻿ The Agnew Family aboard the "Dog House"
It’s approximately a 10 hour drive from Monroe Connecticut to Milton Ontario so we decided to split it over 2 days. That allowed us to take it easy in the morning and leave mid afternoon. After 11 months 2 weeks we are back in Ontario. 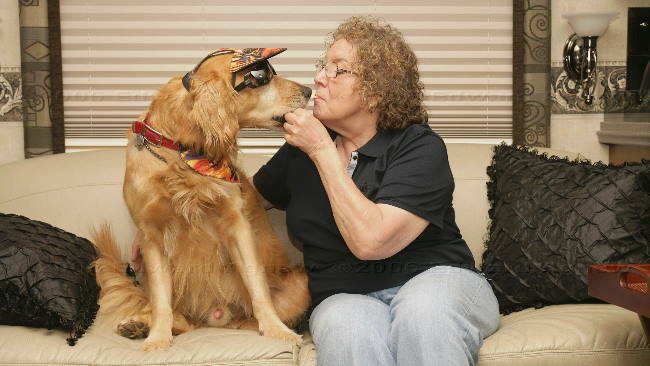 It will be very nice to visit with family and friends, but part of us will long for the road. It's hard to believe that our trip is over --- must be time to start planning the next one. We spent the week visiting our friends Carol and John in Monroe Connecticut. 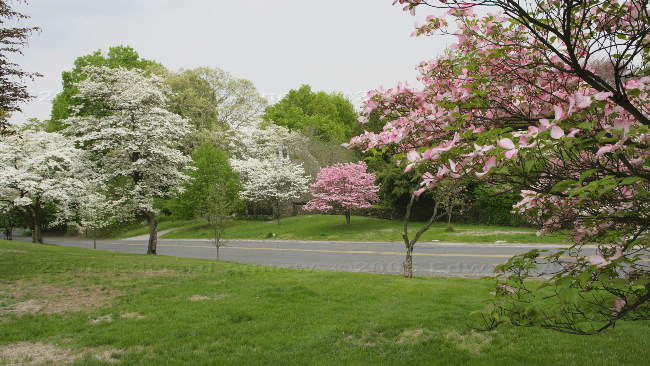 When we were planning the visit we discovered that there are very few campgrounds in Connecticut and none of them are near Monroe. Our friends driveway is very steep with some sharp bends so parking the trailer there was out of the question. Luckily, Gail (Carol’s sister) lives nearby and has a nice level driveway perfect for parking a trailer. Ed, Zaph and I decided to move into John and Carol’s house for the week. It was kinda of weird having all that space, but Zaph loved it and ran around the house squeaking some of his favourite toys. Over the course of the week, we went for some great pizza in New Haven, visited a dog park in Westport, took Zaph for a long walk alone a river, went from a drive to look at the Dogwood trees in bloom and went into New York City. Ed was having “good camera store” withdrawal so he and John headed to their favourite camera stores, while Carol and I headed to the Metropolitan Museum. The four of us met up to attend a matinee performance of ‘The Producers”. If you haven’t had a chance to see this play, it really is hilarious. Before heading back to Connecticut, we went to an Asian restaurant that specialized in Sushi and Vegetarian cuisine (John and Carol are vegetarians). It was good to visit New York City one more time. 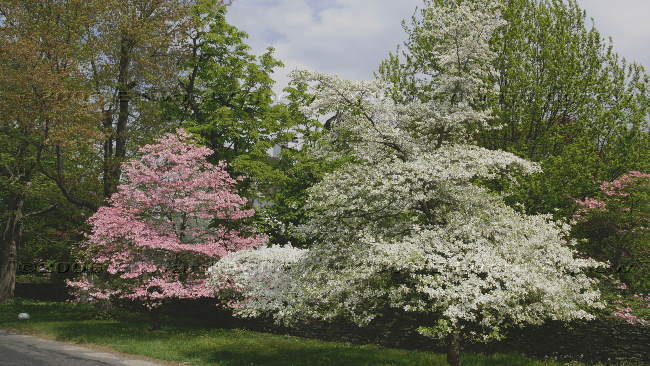 Another view of the Dogwood trees. 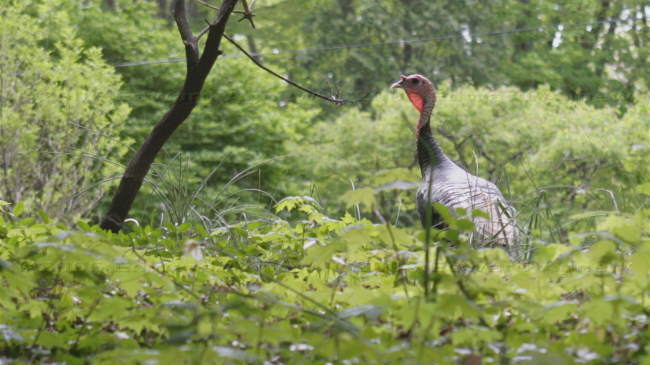 A wild turkey on the side of the road. 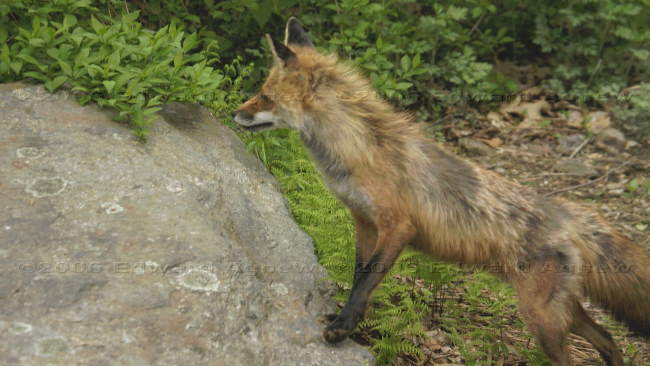 A red fox just outside of John and Carol's back door. Our last stop before heading home is Monroe Connecticut. The computer program said it is a 20 hour drive but we ended up spending 26 hours on the road. The time difference is due to rest breaks, stop lights, traffic and driving slower than the posted speed limit — 75 mph seems a bit fast when you’re pulling a trailer on mountains roads. We decided to drive straight there stopping for the night in Wal-Mart parking lots. On the trip we drove through Missouri, Illinois, Indiana, Ohio, Pennsylvania, New York and Connecticut and I decided that at least on the route we followed Pennsylvania had the best scenery. 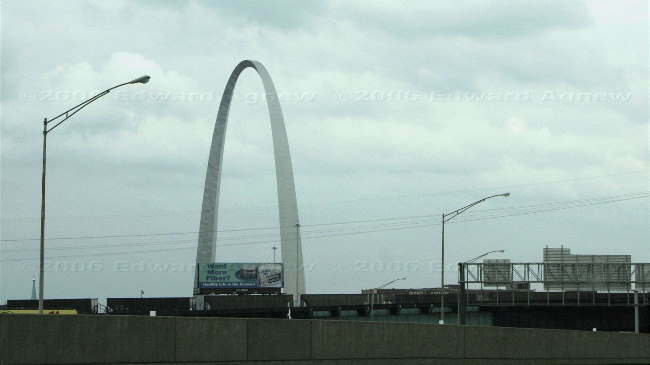 The St. Louis Arch seen from the highway in the rain. 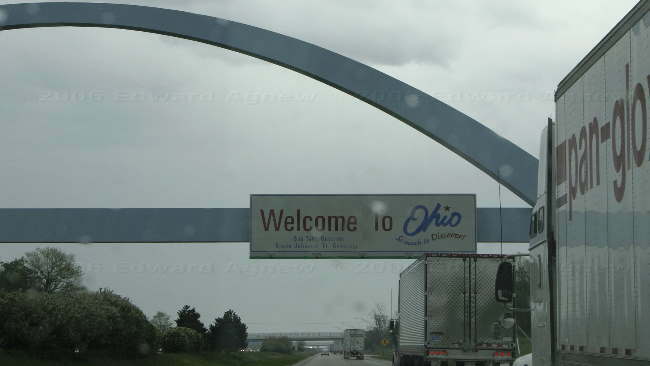 The Welcome to Ohio Arch --- again from the highway in the rain. 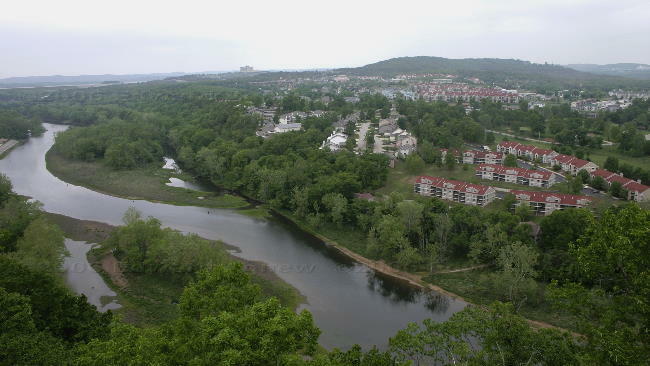 Branson is known for music but it is also a very popular area for fishing and hunting. 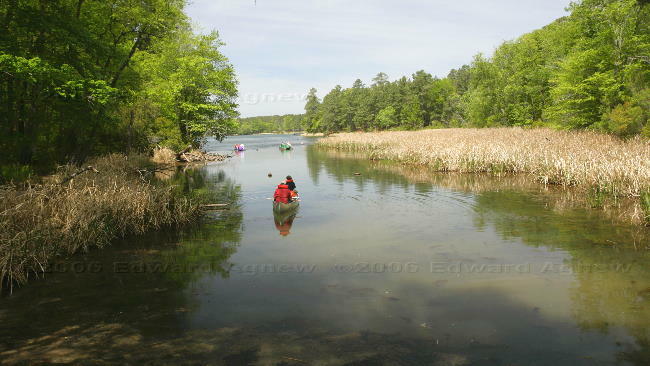 Outside of town are some 5 star resorts that cater to people interested in these outdoor activities. 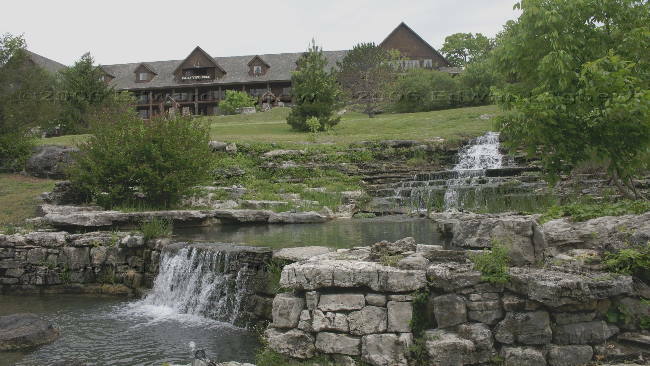 One of the resorts is Big Cedar Lodge Bass Pro Wilderness Resort. They did a fantastic job of creating a “wilderness” experience including driving down a winding road through the woods and fording several “creeks”. Bass Pro also owns Dogwood Canyon Nature Park which offers people the chance to enjoy nature ---- at a cost of course. A self guided walking adventure only sets you back $7.95 per adult. Dogwood Canyon looks really nice but I think I’d rather walk for free at a conservation area. 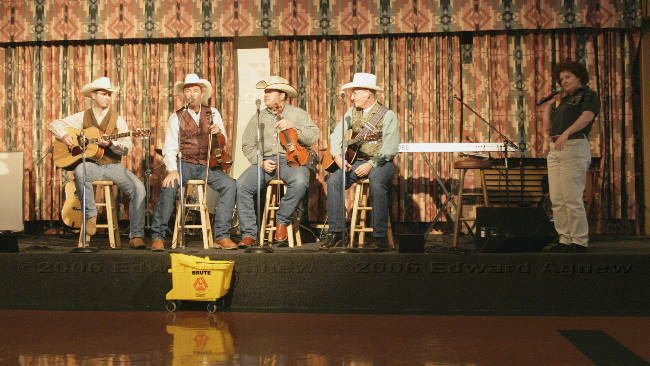 The RV park offers entertainment most nights at the Rec. Centre, and tonight before the main entertainment they had a “Meet the Rep.” session. Performers from three different shows came and the Activities Co-ordinator interviewed them on stage. Each group then performed a song for us to entice us to see their full show. 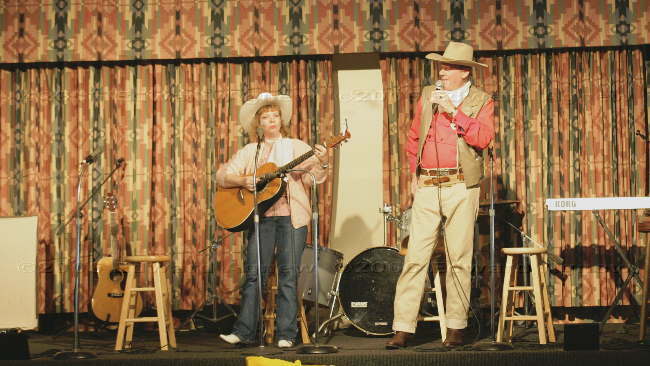 Many of these performers are trying to “break into” Branson’s show arena, and attend events like this to become known. 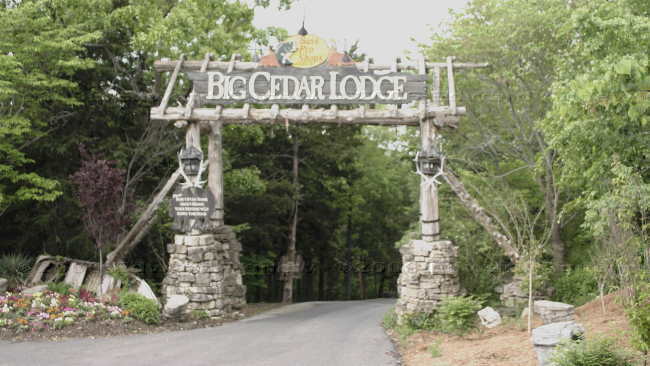 The main lodge at Big Cedar and one of the creeks that cross the roadway. One of the bands that came to the RV park. 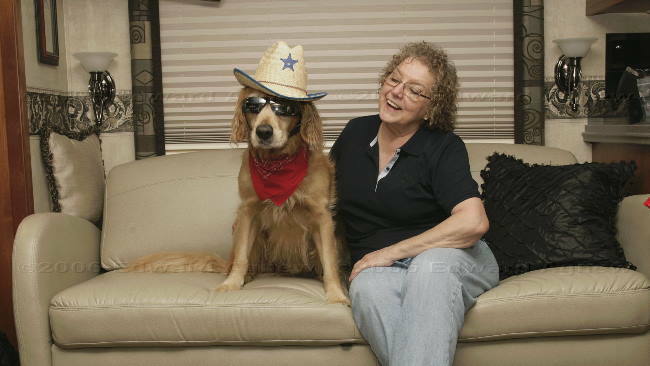 Is that John Wayne? No, but the fella really looks like him and uses the name in his show. There are a lot of lakes and rivers in Missouri which attract many fishermen. 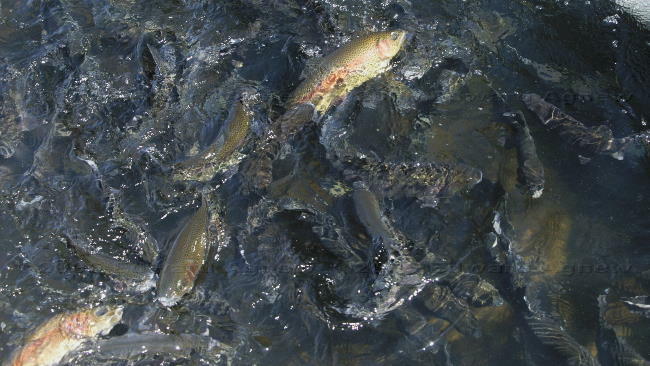 To keep up with the demand for fish the state of Missouri runs several fish hatcheries, one of which is in Branson. The visitor centre has a short video explaining the process from start to fish. Outside are ponds with various sizes of trout fish. 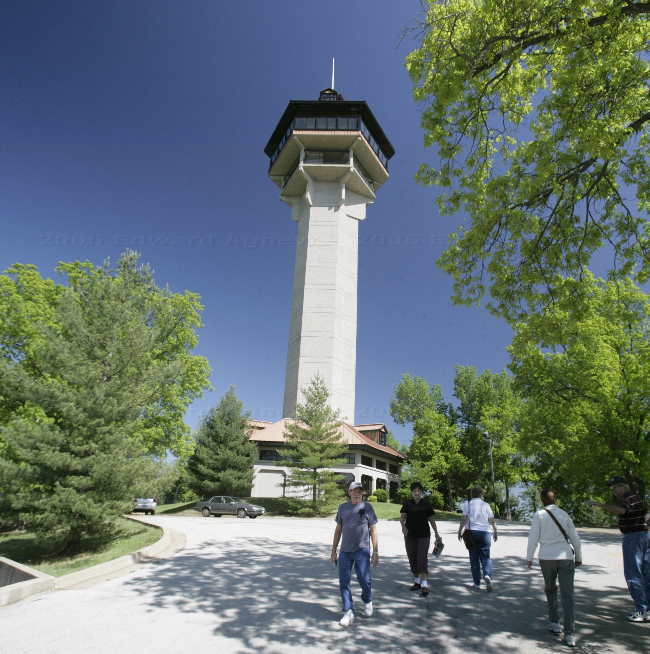 One of the many the attractions just outside of Branson is the “Shepard of the Hills Homestead” at which only the observation tower was open, and we decided to do the tourist thing and pay the $5 (can you believe it) to take the elevator to the top of the tower. The view was pretty good but I not sure that I got my monies worth. Outside a cute shop in Branson. This store had some beautiful pottery and some amazing wood carvings. 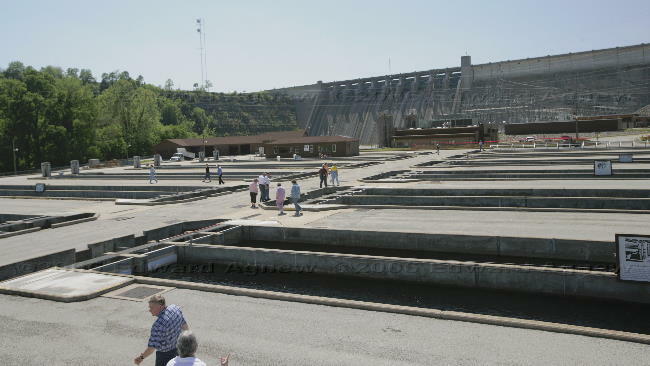 This fish hatchery at the bottom of Table Rock Dam. The trout are attacking!!!! Throwing in a few pieces of fish food caused the trout to swarm to the surface. 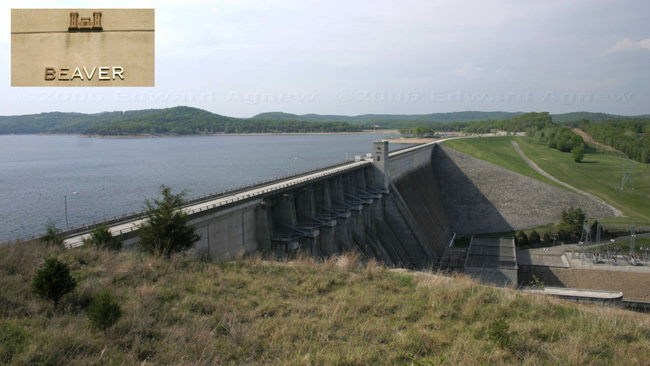 Just outside of Branson is Table Rock Lake and the Table Rock Dam. Zaph decided we needed to spend some time in the great outdoors and suggested (demanded?) we head to the lake. We stopped at the Dewey Short Visitor Centre to learn more about the dam and the lake and then headed out for a walk along the lake and the expected paws in the water. Hey that bus is driving into the water! 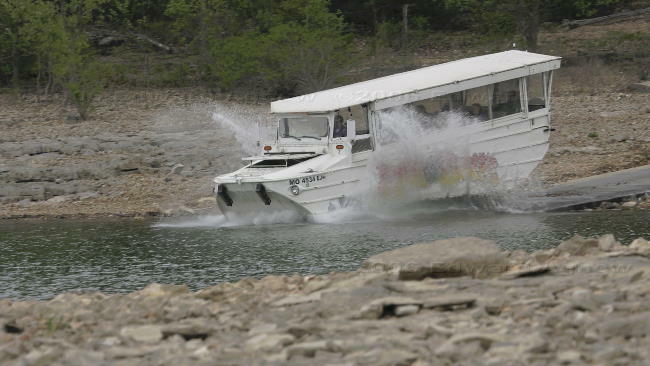 Duck boat tours are popular in Branson. It had started raining late yesterday afternoon and was continuing to rain today. We decided that indoor activities were needed so we headed to Springfield (less than 1 hour away) where Bill and Sadie have their home. Bill drove around the city pointing out the highlights — a couple of universities, a technical college, a new park area built in the old downtown core and “the old money” area. 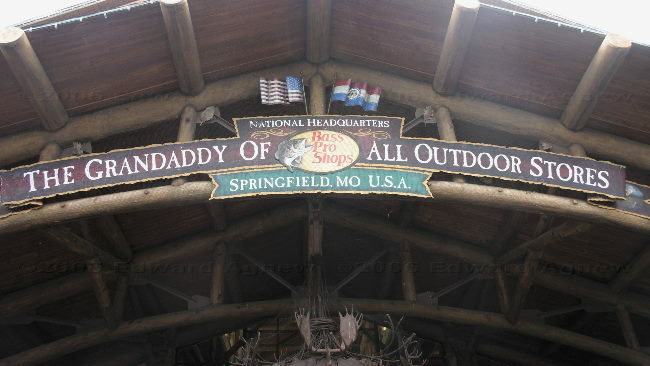 We stopped at the “National Headquarters and the Granddaddy of all Outdoor Stores” (that’s what is said on the building) — Bass Pro Shop. I was amazed by this store — absolutely huge with indoor waterfalls, fish tanks, fish ponds complete with a couple of live ducks, wildlife displays, and a lot of neat merchandise that is related to hunting, fishing and outdoor activities. Somehow Ed and I got out of there without spending a lot of money. 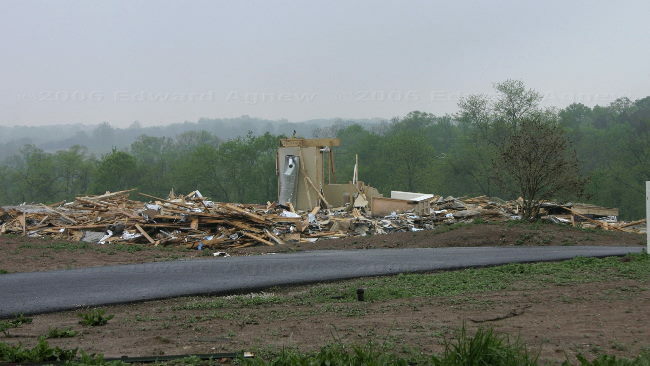 On the way back to Branson, Bill drove us by an area that had been hit by a tornado on March 12. This had been a severe tornado that had stayed on the ground for about 40 miles. 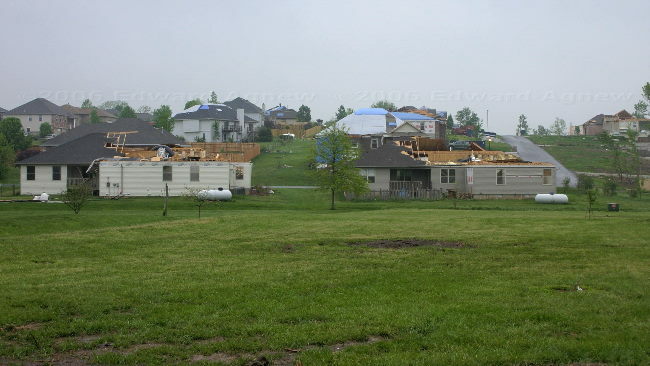 Several houses had been flatten, several other houses had the back half or roofs ripped off, many more were missing roof tiles or pieces of siding and lots of fences were missing. 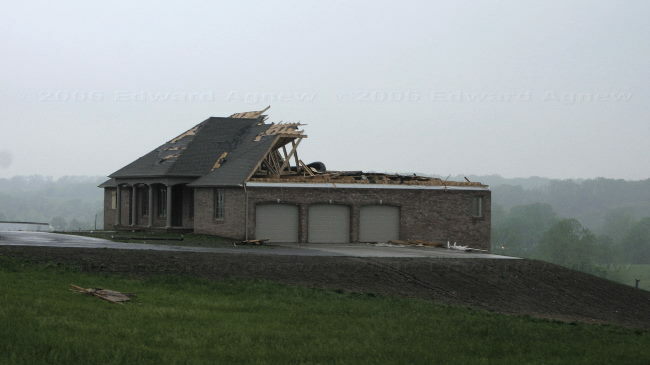 The power and unpredictability of a tornado really hit home when I saw rubble that was once a house beside a house that just lost a couple of roof shingles. The sign at the Bass Pro Shop. Help --- he's attacking me! You can see the path the tornodo took. The brick work appears OK while the roof is mostly gone. One piece of the house was left standing. This morning we packed up the trailer and headed to Branson, Missouri where we were meeting our friends Bill and Sadie at an RV park. The Ozark mountain scenery was beautiful on the drive through Arkansas into Missouri, lots of hills and cattle grazing. After we settled in, Bill gave us a driving tour of Branson and we were surprised at the size of the town considering the population is just under 6,000 — must be all the hotels, restaurants, shows, etc. for the tourists. There was a deal on tickets for “Kirby”, a magician that we decided we couldn’t pass up. The show was good, especially the 6 year old assistant from the audience who got everyone laughing. Why did the Titanic cross the road? ..... It wanted to make a Titanic size traffic jam. 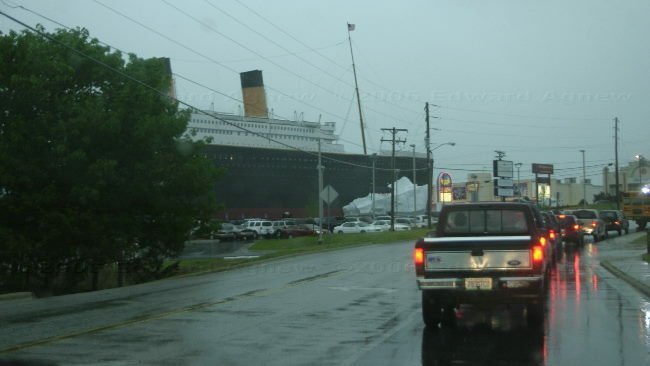 The Titanic Museum is a new exhibit in town. 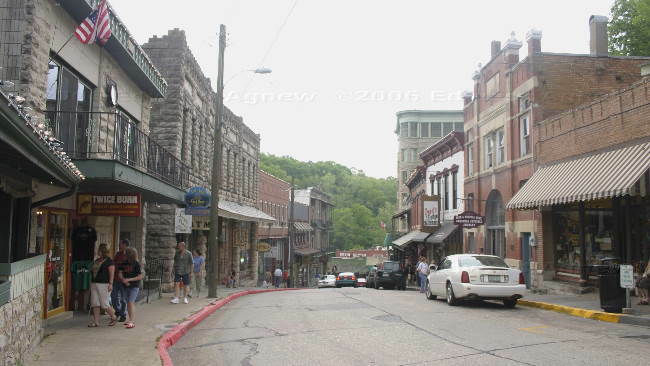 You get a good workout walking through the town of Eureka Springs as every road is either going up hill or down hill. The owner of one store explained that we had walked from street level onto the 2nd floor of her store — the first floor was below ground as the road had been raised 8 feet a century ago. It’s hard to imagine that the roads were even hillier. 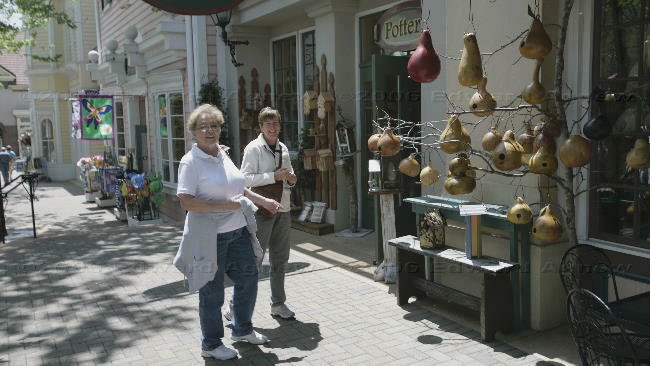 The shops are full of unique items many made by local artists or artists from around the US. As Zaph had waited for us in the trailer while we checked out the stores we decided to take him for a drive and look for a nice place for a walk. The local map showed “Beaver Dam” a few miles down the road from us. “Beaver Dam” turned out to be a large dam built by the Corp of Engineers creating a large lake called Beaver Lake and some beautiful parkland. 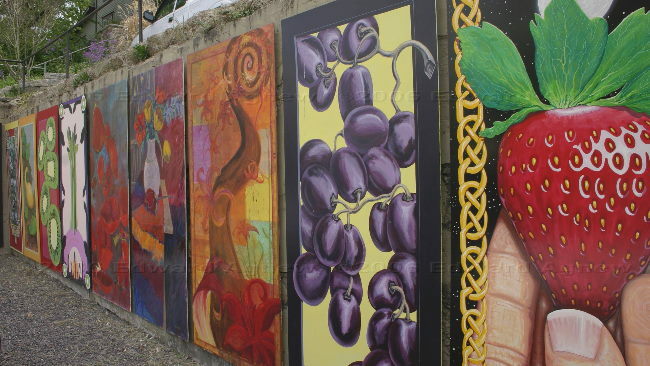 These paintings are done by local artists. You can bid on your favorite one and buy it. The garden of the Basin Spring Hotel. 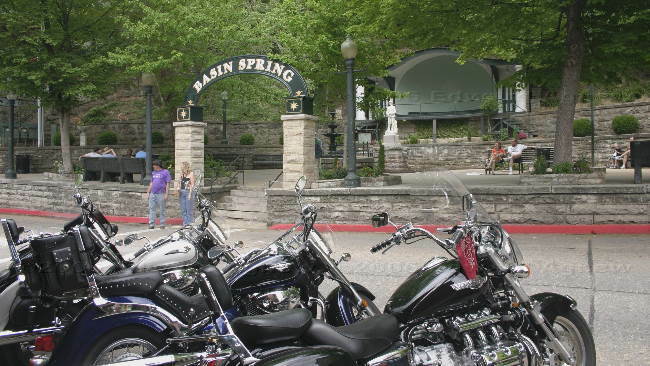 Motor bikes are a common site in Eureka Springs. The area roads attract bikers from all over. 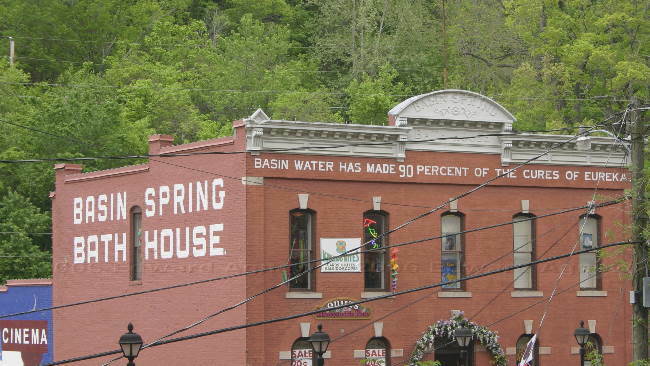 Eureka Springs was famous for it's "healing springs" in the late 1800's. 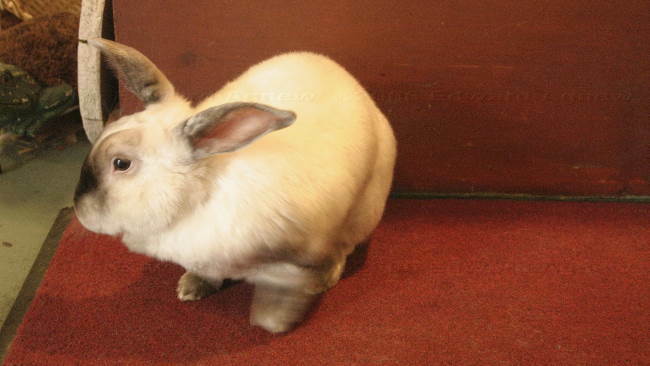 Beware of the "Attack Bunny". Some stores will put everyone to work including the family pet. 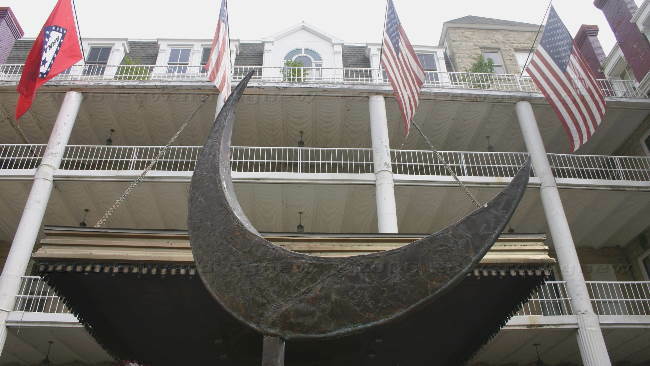 The Crescent Hotel. It sits high on a hill overlooking the town --- people say that it is haunted. A view from the back porch of the Crescent Hotel. 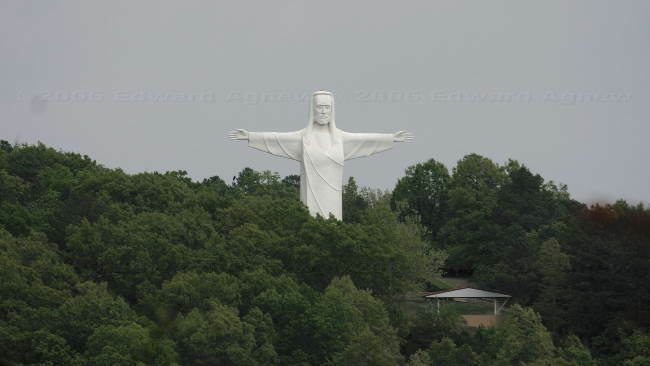 We were standing down the road from the Crescent Hotel and looked across the valley and saw Christ of the Ozarks. It really is tall. This is one big beaver dam .... The insert is the tower you can see in the middle of the photo. The drive today took us into the Ozark mountains where the roads are hilly and winding resulting in some beautiful views. We passed Bentonville, home of the 1st Five and Dime Store owned by Sam Walton, and is now the Wal-Mart museum. As we were pulling the trailer we decided to pass on this stop — maybe next time. About 4 miles west of Eureka Springs we pulled into a KOA. It would be our home for the next couple of nights. 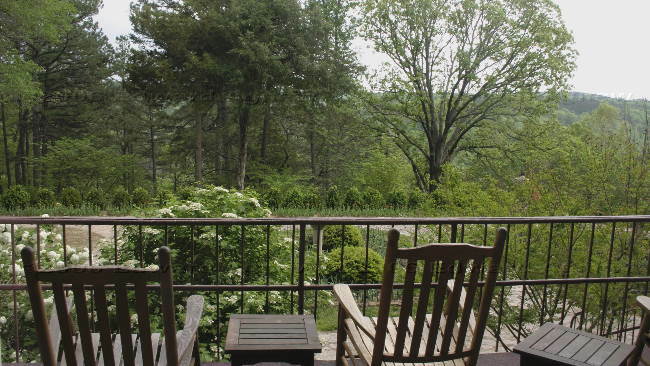 Carol and Darryl had told us we should visit Eureka Springs and we are really glad that we followed their advise. A short distance from our campsite is the Thorncrown Chapel. The chapel was built by a man who had his retirement home here and wanted to share the beauty of the area with others. 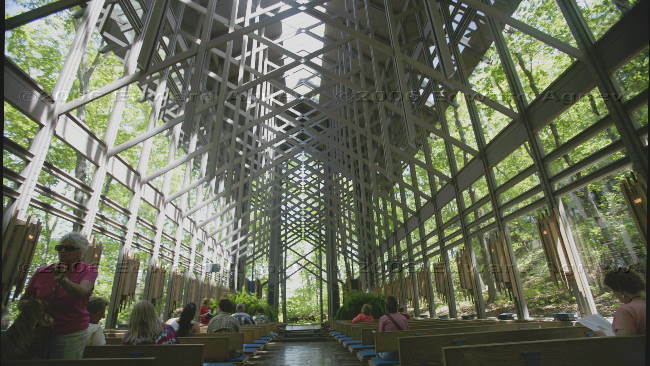 The chapel is 46 feet high, has 425 windows, over 6,000 sq ft of glass and only seats 100 people. It is open to visitors from 10:00 am to 3:30 pm, allowing time for a morning wedding before it opens and several weddings after it closes. I can’t find the words to describe the feeling I got when I was sitting inside the chapel. Our next stop was the Eureka Springs Rail Depot. 2 mile of track has been laid and the old train transverses it several times a day. The “conductor” was a character and told you lots of interesting information about trains. Did you know that conductors dressed in black so the soot from the old steam engines wouldn’t show up on their clothes? 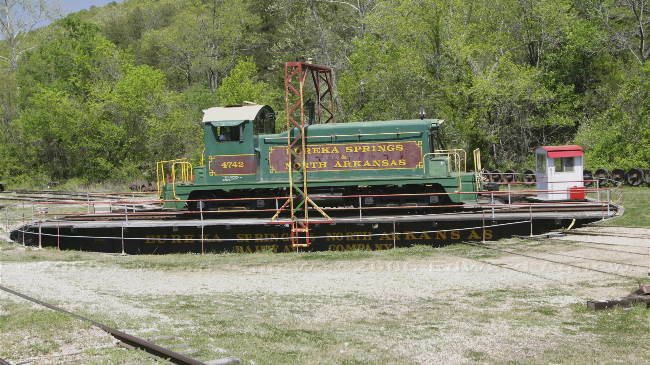 Before we could leave, the engine was moved to the turntable so it could be reversed, and connected to the now front of the train. At the 2 mile mark the engine uncoupled to turn around at a “Y” and couple back up to the other end of the train for the return trip. 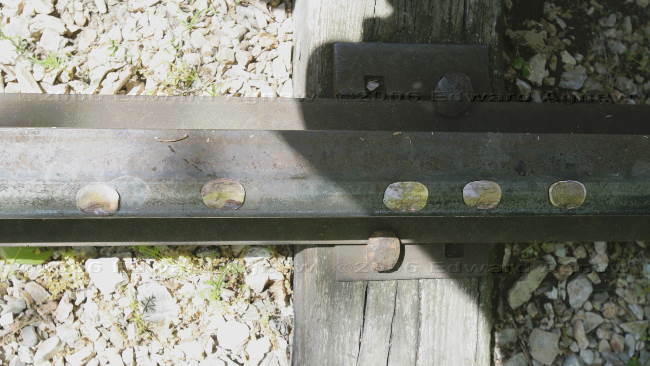 The conductor encouraged us to put coins on the train track so the engine could run over them and flatten them — instant souvenirs. 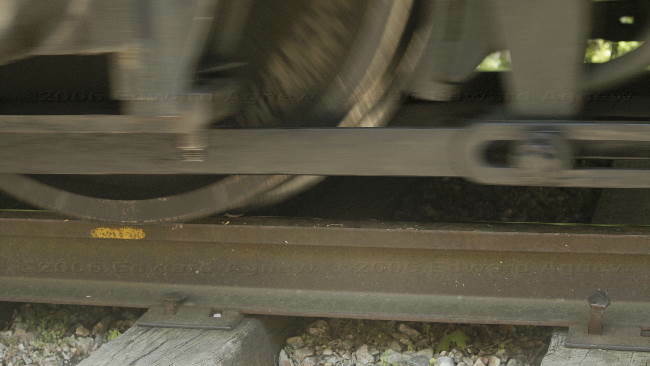 He did say that it wasn’t safe to put anything on regular train tracks and you could only do it here as the engine was moving at a slow controlled speed. Ed and I chatted with the conductor for a few minutes after the ride had ended and he told us that the population of Eureka Springs is just over 2,000 but they have over 4,000 rooms for tourists — definite a tourist destination town. 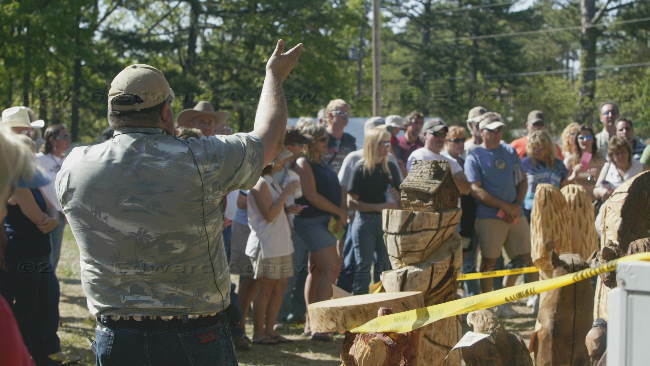 There was a chainsaw carving show and auction today, so we stopped to take a look. The carving was finished when we got there and they were in the process of auctioning off many of the pieces. It really is incredible what some people can do with a chainsaw. 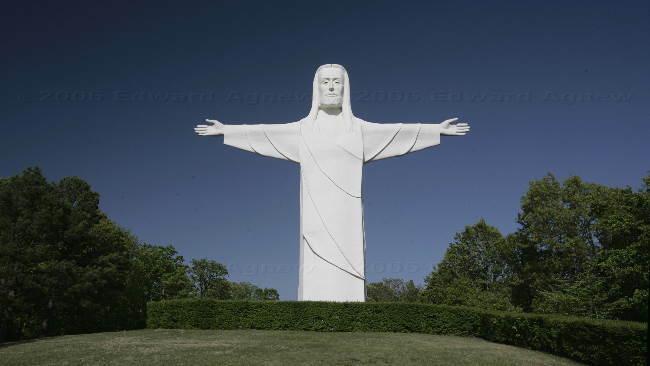 Last stop for the day was the statue of “Christ in the Ozarks”. 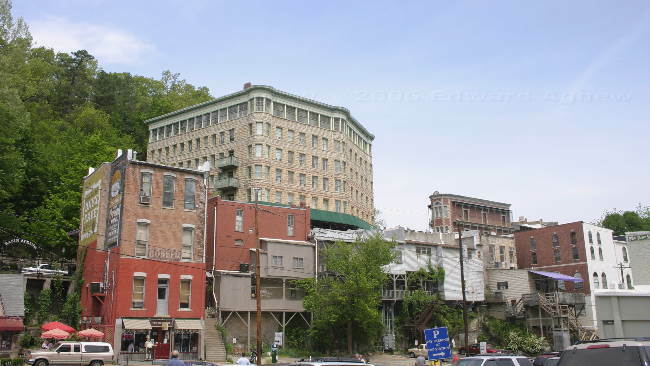 This statue stands at least 60 feet tall (Ed’s guess) and overlooks Eureka Springs. 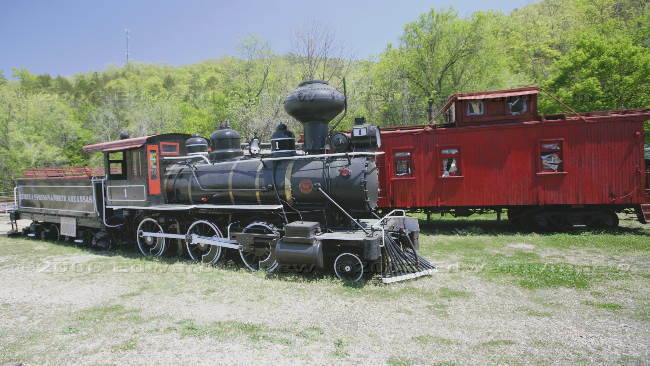 This old steam engine is in working order but no longer run due to insurance costs. 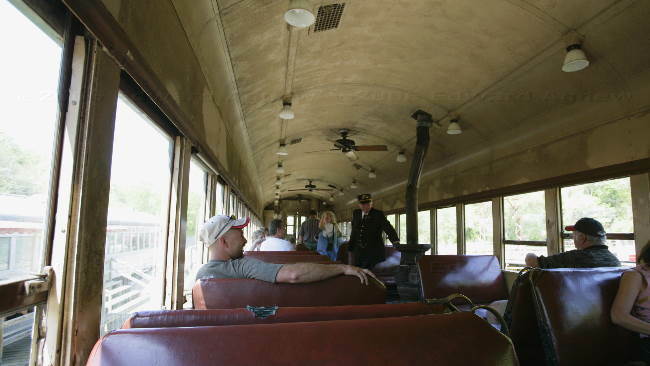 Inside the old commuter car. The engine being "turned around" on the turn table. If you look closely you can see the coins on the track. Auctioning off the wood carvings. Today was a another driving day. Leaving Texas, we headed north into Oklahoma, After of few hours of driving through some beautiful hilly country we turned east in Arkansas. We passed the night at the Wal-Mart in Siloam Springs, Arkansas. Last night there was a thunderstorm and this morning the sky is looking threatening. I’d rather it didn’t rain when we are driving but Texas really needs this rain. Today was a short drive, just a hundred miles to the Cooper Lake State Park where we are spending the night. 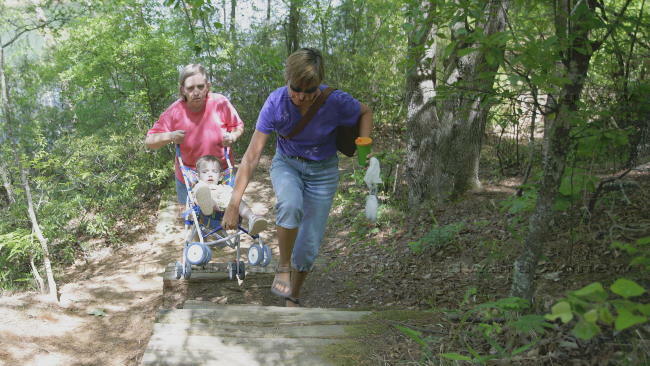 It’s a large park — even has a separate campground section and riding trails for people with horses. 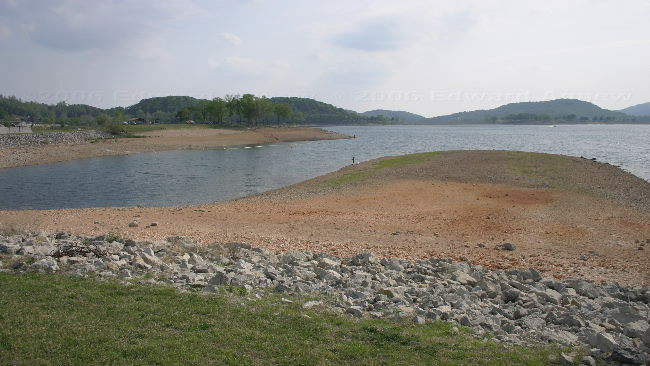 The lake’s water level is so low that only one of the five boat ramps is open. After a week of “vacationing” with Darryl and Carol it was back to reality — laundry, cleaning and errands. Late this afternoon we headed to their place for dinner and goodbyes. We’re going to miss Sarah. The forecast was for another warm sunny day so we (Carol, Darryl, Ed and I) decided to take Sarah to the Caldwell Zoo in Tyler. 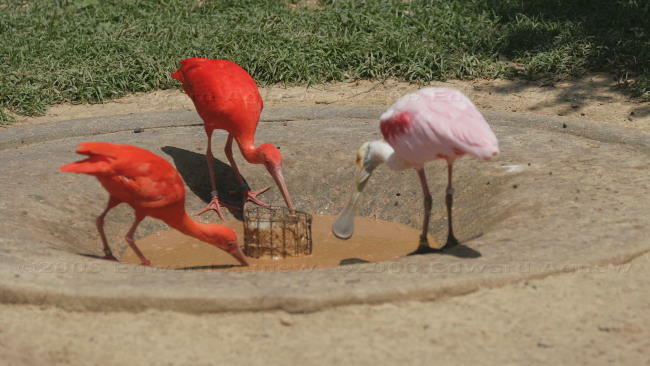 This is a wonderful zoo for kids as there are lots of colourful birds, fish and animals that remain active even in the heat. Of course there are the standard assortment of sleeping and hiding animals (lions, tigers, etc..), but they don’t get an almost 3 year old’s attention, while the parrot that chatters away to you does. A first for me was cattle in a zoo — they had a new exhibit of 2 young longhorn cattle. 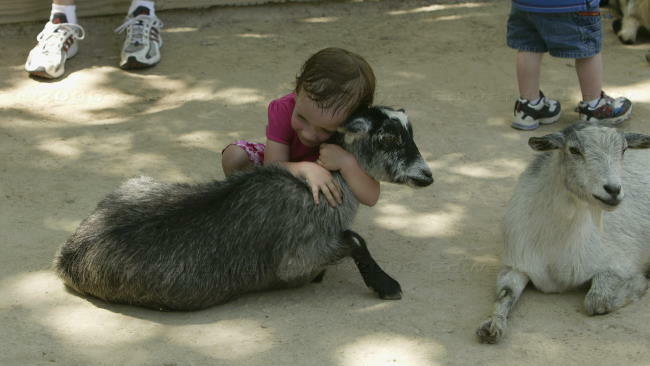 Sarah had a blast — she loved the colourful birds, the river otter, the exotic fish, the penguins and especially the goats in the petting zoo. 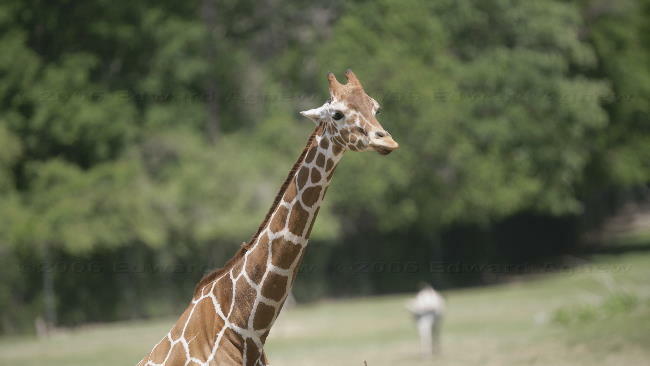 This guy is sure tall. It was time for a quiet day. Darryl gave Ed a tour of his place of work and Carol and I headed out to do some shopping — unfortunately most of the stores were closed. Later in the day, Darryl took me for a ride on the motorbike which was much more exciting than the short ride I had at Port Aransas. 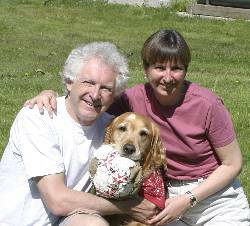 To celibate Easter, Tim and Carol cooked a tasty dinner. 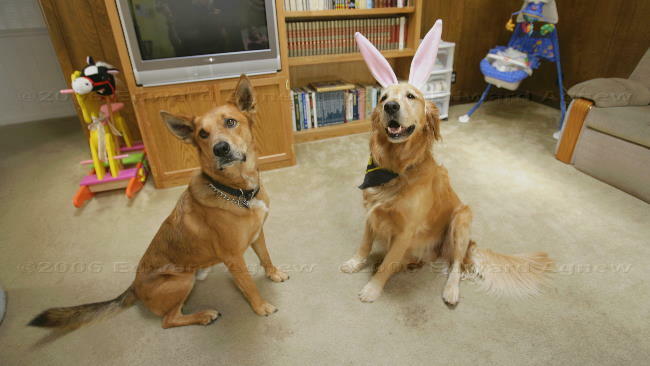 Or perhaps this is this the real Easter Bunny? 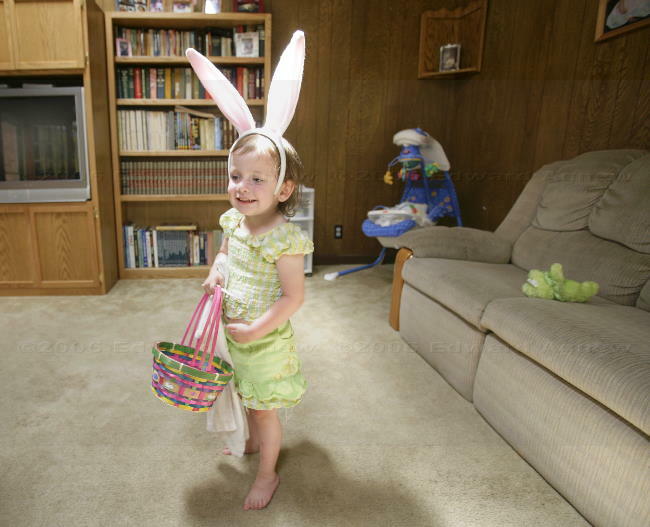 On the other hand; Sara thinks this might be the real Easter Bunny. Ed and Darryl found an ad for a Antique Tractor Show in a near by town, so off we went. There was, as expected a lot of old tractors which of course thrilled the two guys. 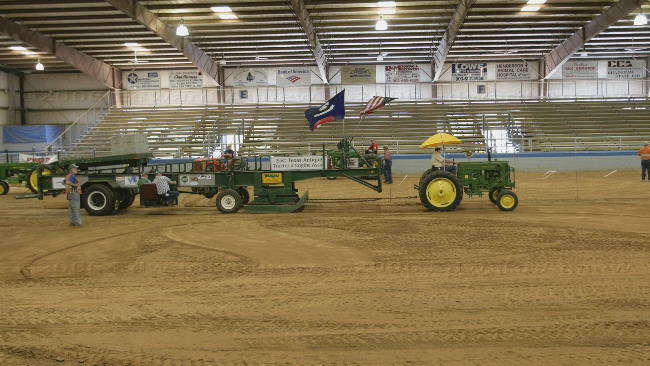 The first event we watched was the Antique Tractor Parade — only one tractor stalled and had to be towed out of the arena. The second event we watched was the Tractor Pull. Tractors are hooked up to a sled that has a sliding weight on it, such that the more forward the weight, the greater the drag the sled creates. The weight moves forward at different rates depending on the weight class of the tractor. The object is to pull the sled as far as possible on a sand surface. It sounds kinda of weird but it was fun to watch for the first hour! 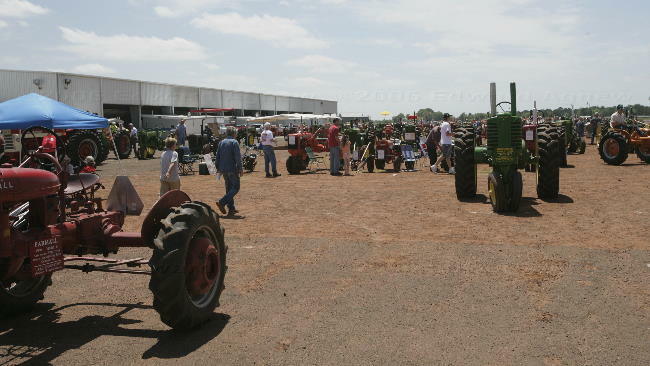 The Antique Tractor Show is a real family event as there were grandparents, children and grandchildren from the same family competing and being cheer on by other relatives. 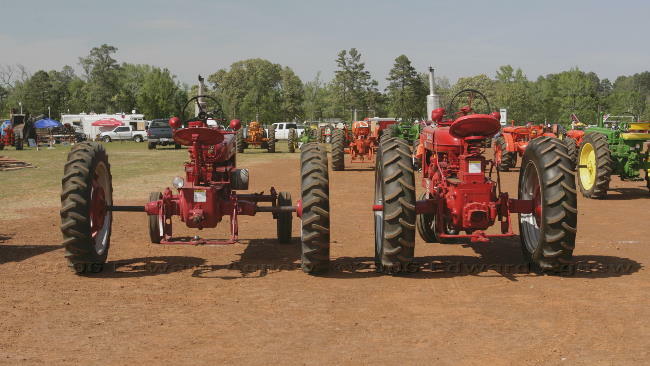 There were a lot of tractors at the Antique Tractor Show. The big event is the tractor pull. The tractor is attached to a sled that has a weight that moves forward creating more resistance. The one who can pull it the farthest wins. 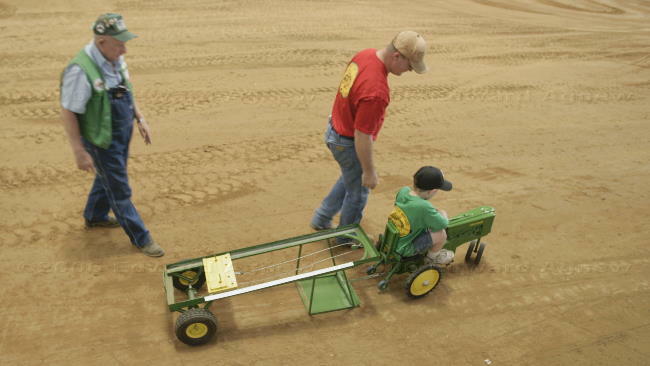 The "mini-tractor pull" for kids --- It was hard work. This reminds me of the cartoons where the characters legs get stretched. Or perhaps the wide track gives better high speed handling... at least that what the car ads indicate. 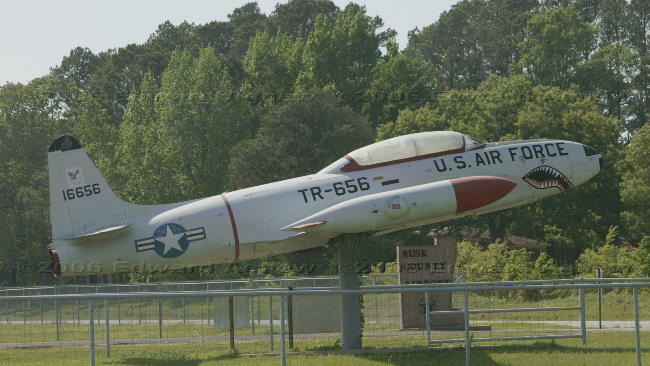 The Antique Tractor Show was held beside the community airport where this trainer jet was displayed. Carol (my sister), Darryl (brother-in-law), Sarah (Carol and Darryl’s almost 3 year old granddaughter), Ed and I headed north of Tyler to the Tiger Creek Wildlife Refuge. 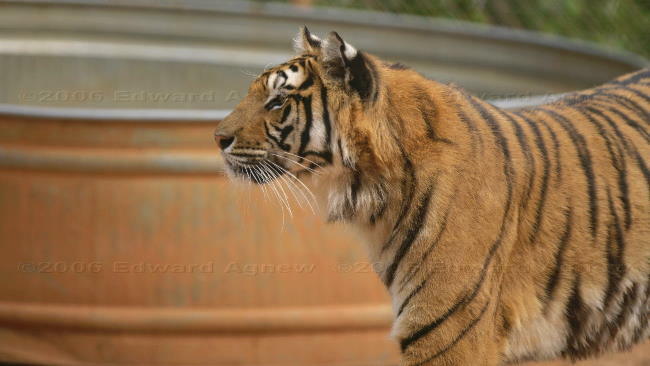 The refuge mainly rescues tigers but also has a few lions and 3 leopards. 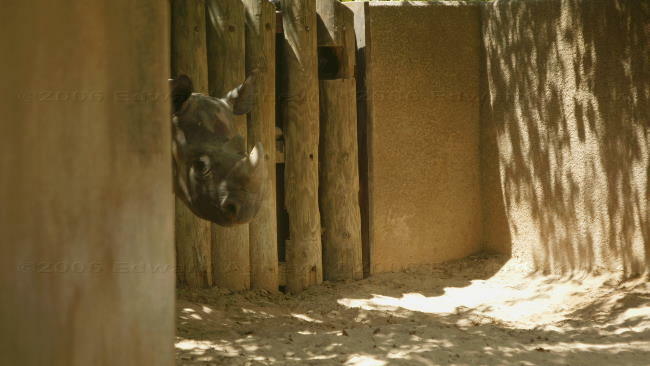 The animals have come from a variety of sources — private owners, a circus (a tiger had stage fright and couldn’t perform his tricks in front of an audience), Michael Jackson (his trainer was in an accident and could no longer take care of the 2 tigers), a wildlife safari park that closed, etc. 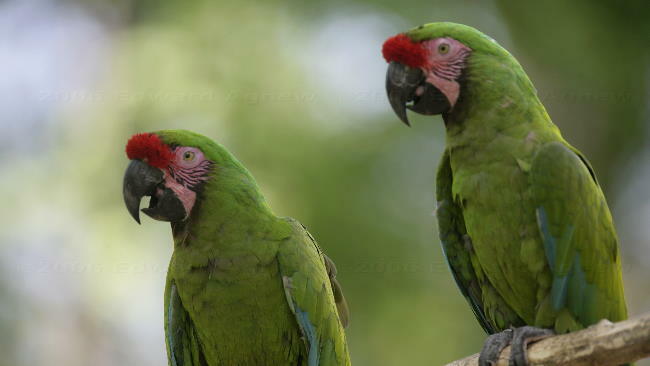 Visitors to the refuge are given a tour introducing each cat along with a brief history of their lives. 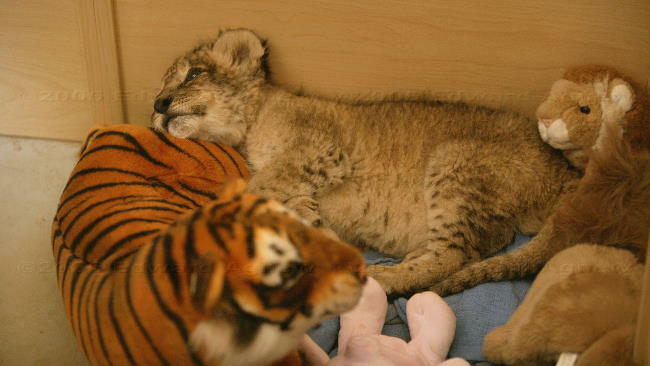 In the office we visited with a 6 week old tiger cub that the refuge is taking care of for another refuge — very cute. 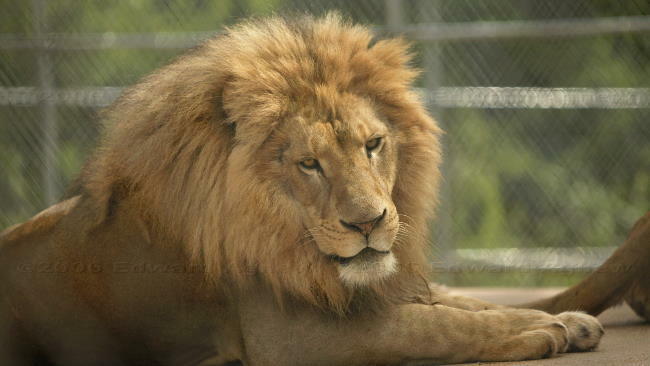 On the tour, our group was standing outside of a cage when the cat roared and stood upright at the fence ---- he doesn’t like people very much and wanted to let us know. 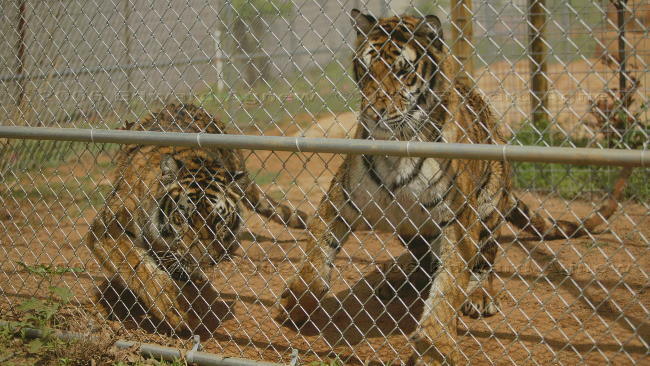 While we were stopped by a large pen with 2 tigers in it, Sarah bent down and put her two stuffed animals under the outer fence (there was at least 10 feet between the outer fence and the cage). The tigers got very exciting thinking there were 3 “nice toys” to play with. This made us realize just how dangerous large cats can be even though they are adorable as cubs. 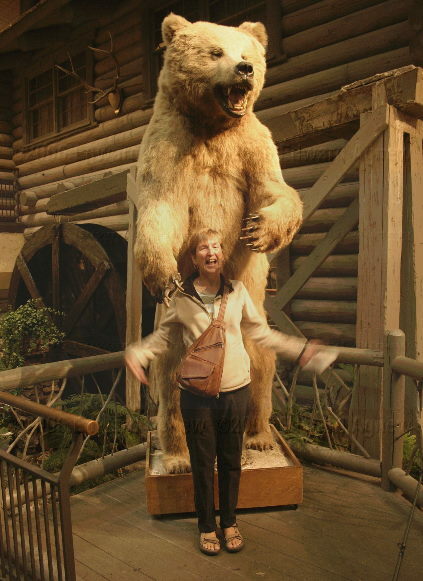 I couldn’t believe it when our guide told us that it is legal to own a large cat in over 30 states. We stopped at Tyler State Park for a nice picnic lunch and walk around the lake. It reminded me of the Ontario provincial parks where we have camped. One of the tigers. The steel container is full of water as the tigers enjoy playing in water. The two juvenile tigers that were excited to see Sarah and her stuffies. Which one is the real tiger cub? The lake at Tyler State Park. Princess in training, Rule 7; get your servants to carry you and your royal carrage whenever possible to insure comfortable ride. Omar Lucas Sarr arrived today. He is the first grandson for my sister and her husband. We spent the morning at the hospital visiting with him and his parents. A tour of Tyler was the order of the afternoon. The highlight was a stop at the Rose Garden. 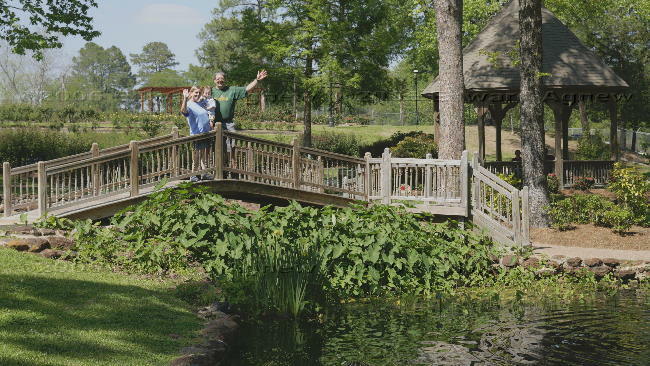 The town’s website describes it as “The Tyler Municipal Rose Garden is a 14-acre park, making it the nations largest rose garden. The garden is full of breath-taking beauty, especially in the spring and again in mid-October when the Rose Garden is in full bloom. 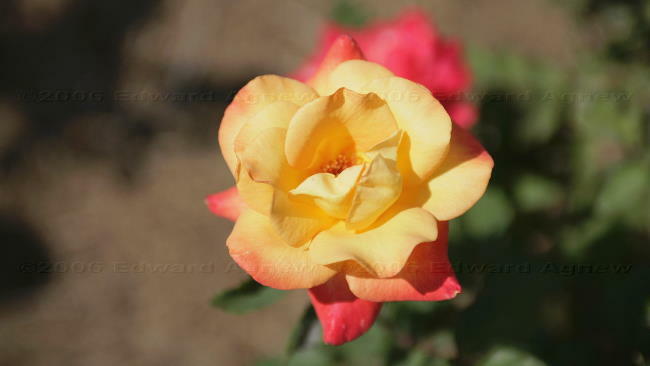 There are over 38,000 rose bushes of at least 500 different varieties, from tall grafted rose trees to miniature roses no larger than a dime.” Over half of the rose bushes were in bloom giving us a show of vibrant colours. The garden itself is lovely — there is a bridge over a pond, a gazebo and several arbors — I’m sure it’s a favourite place for taking wedding photographs. 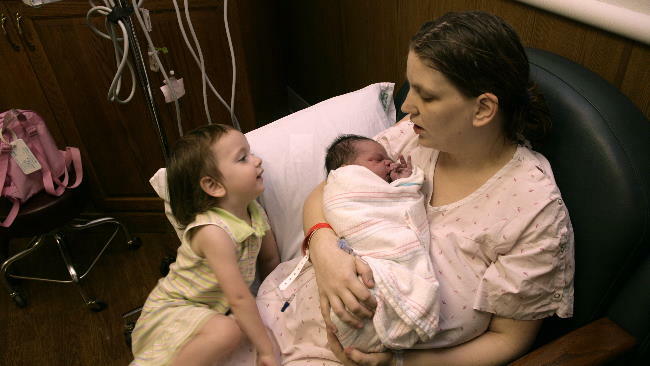 Kim with Omar and Sarah. 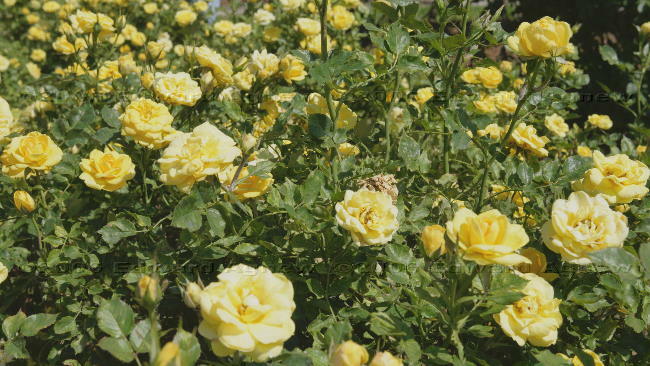 There were many different varities of roses. We were facinated by the multicoloured roses. 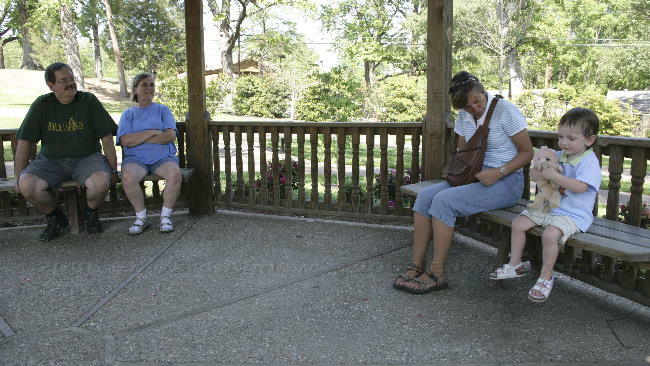 Darryl, Carol, Frances, Sarah and her friends Care Bear and Little Zaphie were enjoying the meditation gazebo at the rose garden. Caral, Sarah and Darryl on the bridge. Wouldn't that be a great spot for wedding photos? We packed up early and headed for eastern Texas where my sister and her family live. Using the internet we had found a campground on Lake Palestine about 15 miles from sister’s home. Our campsite is a few hundred feet from the lake but we have a nice view of it.